I found the room in which the doctor saw me surprisingly warm and cozy considering the aseptic quality in its nature. The machines it held looked powerful and precise, unlike the multitude of small tools one sees at the general practitioner. He only worked with ear, nose, and throat, and I appreciated his specificity. Sitting me down in a chair over which the arm of a brawny ear machine hung, he began examining my left ear. “It’s my right ear that’s clogged,” I insisted. He ignored my remark and continued examining the ear while collecting a few metal instruments from a nearby stand. “Have you had ear surgery recently?” he asked. “And you don’t have any hearing implants?” His look was disconcerting. He spent a moment mulling over the condition of my ear. “This is going to be uncomfortable,” the doctor admitted. My father looked on from a few feet away, standing in the doorframe. The doctor began to probe the inside of my ear with a stiff stick-shaped ear cleaner made of slender surgical steel. It was cold and shrill. I could feel the heat gradient between my oppressive ear lining and the room temperature steel. He worked his way in methodically and without relent. I could not refrain from wincing. Finally he withdrew the steel instrument and rolled its contents from the scoop at its end into his palm. Encased in a light coat of wax was a light-brown hemispherical body smaller than a candy button. The doctor looked at it quizzically. My father scooched closer to get a look. Staring at the object I began to notice a pattern on its surface. There were seven black dots across the top of it. As the body was brought closer to the light, its casing radiated orange and red through the wax. The doctor continued to wriggle in bafflement. I awoke to a rustling. Immediate and deafening, it seemed to radiate outwards from the inside of my head. It rolled around inside my ear, alluding to the restlessness of a microphone clipping violently as it is carried along a stretch of windy beach. I scanned my bedroom looking for the source of the sound or a trace of a disturbance. Nothing in the room was out of place. A balled up piece of paper crackled within me and I started clawing at my ear feverishly. It burrowed into my brain. I dug my nails into the lining of the ear in an attempt to drag the intruder outwards. A minute of hysteria writhed by. The rustling continued but quieted. I rolled across the bed as a dog rolling in a rotten corpse. Inexplicably the whisper abated. As I began to notice sounds beyond the boundaries of my skull several realities set in. I became cognizant of my hyperventilation. I was alone in my bed, sweating profusely. Darkness receded from the corners of my eyes, disassembling the vignetted frame of anxiety. The canal had become stagnant. I have dream problems. When I wake up during a dream, it often takes me a few minutes to remember what is real and what is imagined. The consequences of this part of me range from trivial to paralyzing. Sometimes I wake from nightmares in which a parent has perished and I lay distressed in bed unsure of their existence. In the wake of the ladybug’s incursion, I went to the bathroom to inspect my left ear. It looked like the same old ear. I pulled on it and brought it close up to the mirror in an effort to see its insides. Nothing poked out. I started to think about my breathing and slow it down. There was nothing in my ear; it was just a nightmare. Noticing that my bedroom window was ajar, I promptly shut it. Dreamless sleep. I hate hallucinating. A few days following this nightmare I went for a dip in the Schlachtensee. My right ear became clogged with water and refused to clear after I emerged, leaving me deaf on one side. The afternoon passed and I attended a dinner party, turning left ear towards the other guests to hear them. I slept with my clogged ear rested on the pillow and when morning came it remained clogged. I went troubled to the doctor and the pressing violation of my inner sanctity became evident. The bug was expelled and the clogged ear was then emptied using a mighty invasive squirt gun. Three months have elapsed and at anxious night I sometimes return to thinking of the ladybug. Did it pick my ear intentionally? Did it anticipate its own death and seek out a deathbed? If I were dying, I would want to finish the job in a warm, cozy place, a mucous membrane perhaps. I am thankful that my other ear became clogged and I had to go to the doctor. It is not often that trauma passes from the realm of hallucinations to the tangible, clasped in the hands of grown-ups and endowed with actuality. More often the opposite occurs. Real-life events bleed into our dreams and haunt us repeatedly. We often shrug off our nightmares and the impact they have on our lives in the days that follow. 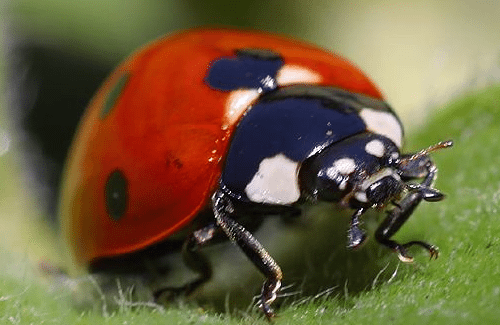 Although the process of removing and recognizing the ladybug was disturbing in its own right, to know that one potent minute of terror and confusion was not a hallucination affirms my sanity. The corpse is gone, but I can say in earnest that I have been the pit in which one has buried itself alive. On a less contemplative note, I am simply glad to not have it physically in my body. The ladybug could have stayed for months before causing a problem, cozied in my canal and sheltered from the elements. Preserved by my wax. A bug in a boy. Exoskeletons inside skeletons.